On a 90-degree day this past week, the Schulte girls and their friends held a lemonade stand for the Ben Smiles Memorial Foundation. A few months back, I announced a summer fundraising campaign for Ben Smiles here on the blog. My Fox Valley friend Elizabeth Gerlach and her husband Rob started the foundation in honor of their son Ben. Ben, who attended Buddy Break at Chapelstreet Church alongside our Elsa, passed one year ago. Such an unimaginable heartbreak. After numerous viruses and hospital stays, he caught Adenovirus and passed away from respiratory failure. Ben was a joyful boy, who lit up many, many lives. He had dear friends who cared about him, and he laughed and smiled a lot. Here are some photos from our lemonade stand. Elizabeth and her kiddos were able to stop by, which meant so much! And a huge thank you to our friends and neighbors for their support. Pictured: The core lemonade crew. Not pictured: Moms and babysitters, babies in strollers and carriers, two shy toddlers, and my youngest, who slept through most of the fun. The fruits of our labor, all for Ben Smiles! The beautiful Gerlach family - so glad you could make it and meet our neighborhood friends! 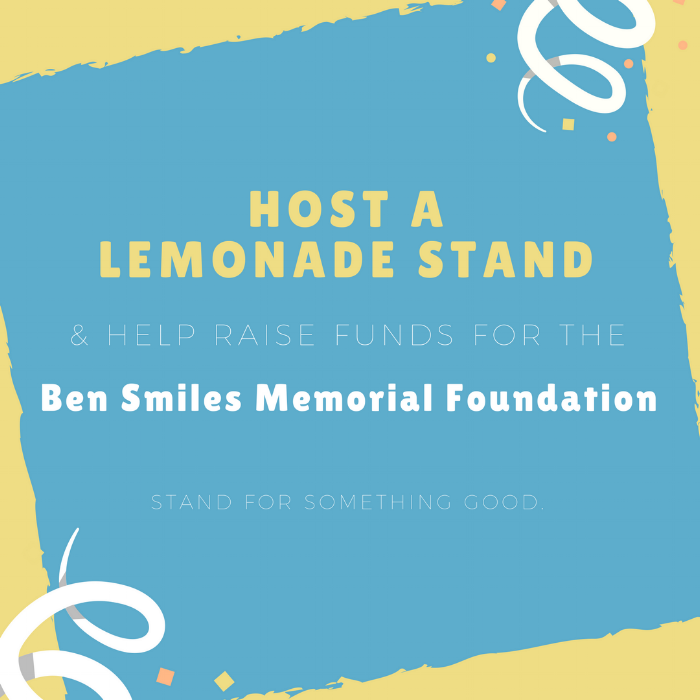 The lemonade stand campaign is a great way to undertake a summer bucket list item, while also helping others and spreading the word about an amazing charity. Visit Ben Smiles on Facebook to notify Elizabeth of your stand and share your pics, to keep the fun and inspiration running through the rest of the summer!